Cboe bitcoin futures are coming on Dec. 10, followed by CME bitcoin futures on Dec. 18. Investments in the stocks of Cboe Global Markets and CME Group are less risky ways to play the bitcoin craze. Investing directly in bitcoin via a decentralized bitcoin-specific exchange or by buying Bitcoin Investment Trust, which holds bitcoins, is very risky. While the price of bitcoin could continue to defy gravity for some time, it could also plummet at any time. There’s a less risky way for investors to get a piece of the bitcoin craze: lnvest in one of the two holding companies, Cboe Global Markets (NYSEMKT:CBOE) and CME Group (NASDAQ:CME), that own the U.S. financial exchanges on which bitcoin futures will soon start trading. Chicago-based Cboe Global Markets will kick off bitcoin futures trading in the U.S. on Sunday, Dec. 10, with fellow Windy City-based CME Group following suit on Monday, Dec. 18. The Nasdaq, owned by Nasdaq Inc., is planning to offer bitcoin futures in early 2018, according to reports from several outlets. The NYSE, owned by Intercontinental Exchange, is taking a "wait-and-see approach" regarding bitcoin futures, CEO Jeff Sprecher was recently quoted by Market Watch as saying. The adoption of bitcoin futures trading by U.S. exchanges should help to further legitimize the cryptocurrency. At the very least, it represents a mainstreaming of bitcoin. This factor has the potential to further increase demand for the hot cryptocurrency. On the other hand, bitcoin futures trading could make it easier to short bitcoin, which could "potentially [undermine] the current buyer-heavy market," Intercontinental Exchange's Sprecher said, according to Market Watch. Investors in bitcoin will profit only if the price of bitcoin rises, while some investors in bitcoin futures will profit and others will lose. However, investors in Cboe and CME should stand to gain as long as trading volume remains high, making investing in these companies a safer way to play bitcoin fever. Of course, these companies will be far from pure plays on bitcoin, so they're not a good bet for investors wanting something closer to a pure play. But keep in mind that moving further along on the pure-play spectrum will increase your risk. 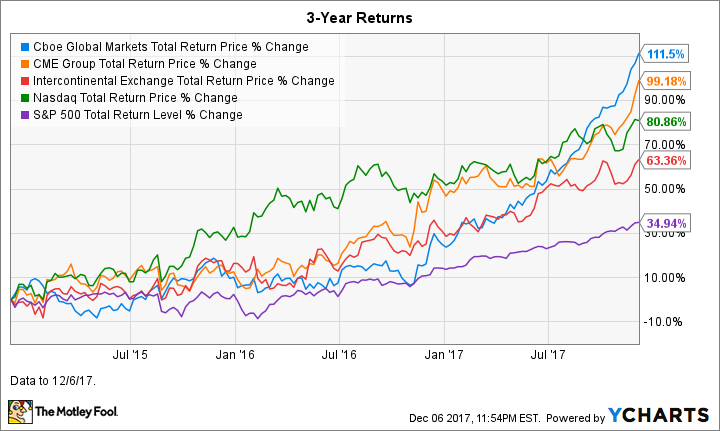 Stocks of the companies that own financial exchanges have been performing well, reflecting their strong financial performances. Cboe and CME have been particular outperfomers in recent years, thanks in part due to the tailwind they're received over the last several months from their plans to launch bitcoin futures. Data by YCharts. Cboe Global Markets is the second largest stock exchange operator in the U.S. and one of the world's largest exchange holding companies. It offers trading in options, futures, U.S. and European equities, exchange-traded products (ETPs), global foreign exchange (FX), and volatility products based on its proprietary volatility index, VIX. It owns the largest options exchange in the U.S. and the largest stock exchange by value traded in Europe. Cboe recently reported robust third-quarter results: 19% operating profit growth and 25% net profit growth, after adjusting for its purchase of Bats Global Market last February. Results were driven by increased trading in VIX futures and index options. CME Group is the world's leading derivatives marketplace. Its exchanges -- CME, CBOT, NYMEX and COMEX -- offer futures and options based on interest rates, equity indexes, foreign exchange, energy, agricultural commodities, metals, weather and real estate. CME's Q3 results were solid: Revenue and adjusted earnings per share (EPS) increased 5.8% and 13.3%, respectively. Results were driven by a 10% increased in average daily trading volume, including records in energy and metals. What if bitcoin fever ends? Cboe and CME should profit in line with trading volume of bitcoin futures. If the price of bitcoin drops and stays low for some time, the exchanges would likely see a drop off in bitcoin futures trading. However, Ethereum, Bitcoin Cash, or one or more of the other existing or future cryptocurrencies could emerge as even more popular than bitcoin and could have greater staying power. If this happens, you can bet that Cboe and CME -- and perhaps other exchanges -- will give the green light to futures trading of these cryptos. Taking this scenario a leap further, even if all cryptos go the way of the (extinct) dodo bird, it seems a good bet that there will be another next-big-thing in the financial markets world -- and another and so on. An investment in Cboe or CME is essentially a bet on the U.S. financial markets. Granted, this bull market, now in its ninth year, can't last forever and there will likely be some bumps in the road, such as recessions, but these investments should prove solid ones over the long term. That is, if the U.S. remains a financial markets power for some time -- which seems a pretty good bet.